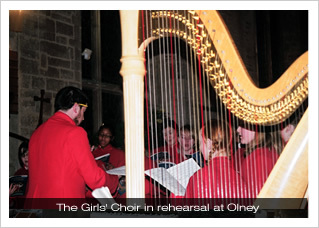 On Sunday 11 January the choirs of Boys and Girls visited a snowy Olney Parish Church to give the final concert in their series "A Little Britten". The angelic voices of the Senior Choristers of All Saints Northampton soared with perfect tuning and precision in the closing section and attacked the music with real character in «Domine Jesu Christe». They are a credit to their nation's choral heritage. He jump'd into a quickset hedge, and scratch'd out both his eyes. But when he saw his eyes were out, with all his might and main. He jump'd into another hedge, and scratch'd them in again. If you missed this concert then the next chance you have to hear the Boys and Girls together is on 14 March - Mothering Sunday - at 10:30am when they perform one of their favourite pieces, Bob Chilcott's "A Little Jazz Mass" for Mothering Sunday.